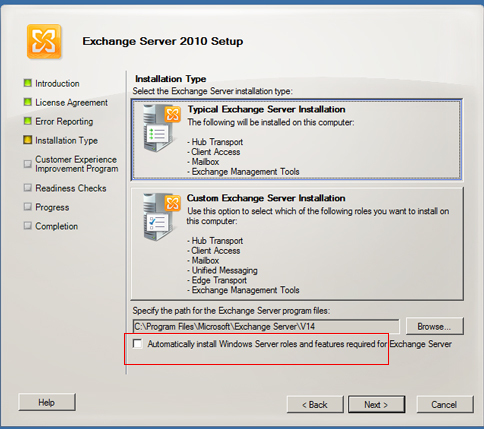 TechSpot: Installing Required Software Components Prior to Exchange Server 2010 Setup. Installing Required Software Components Prior to Exchange Server 2010 Setup. In order to prepare a Windows Server 2008 R2 for Microsoft Exchange 2010 installation, you have to install several components. Most of the components are available in the server itself in the form of Roles, Features, and Role Services. You can use PowerShell to instantly add all the required components on the Server. But few of the components needs to be Downloaded from Microsoft websites and installed. Microsoft .NET Framework 3.5 Service Pack 1 (SP1). Microsoft .NET Framework 3.5 Family Update for Windows Vista x64, and Windows Server 2008 x64 updates. There are several component to be added including IIS services. But it depends on the roles installed. You can use below PowerShell command to add necessary components for a typical Exchange Server 2010 installation with three roles, Hub Transport, Client Access and Mailbox. Open PowerShell using elevated account. server to finish the installation process. restart this server to finish the installation process. WARNING: [Installation] Succeeded: [Remote Server Administration Tools] Active Directory module for Windows PowerShell. You must restart this server to finish the installation process. must restart this server to finish the installation process. Restarting the system is mandatory at this point to proceed further with the Exchange Server 2010 deployment. Also, find out more checklists while preparing a network for Exchange Server 2010 deployment here. An Easy Method to Speedup Windows 7 Login.